For a while now I’ve been checking out Collistar stands. They have cute nail polishes and colorful eyeshadows, lovely blushes … but for long time their focus was more in the shimmery/glitter specter of the make up rainbow. 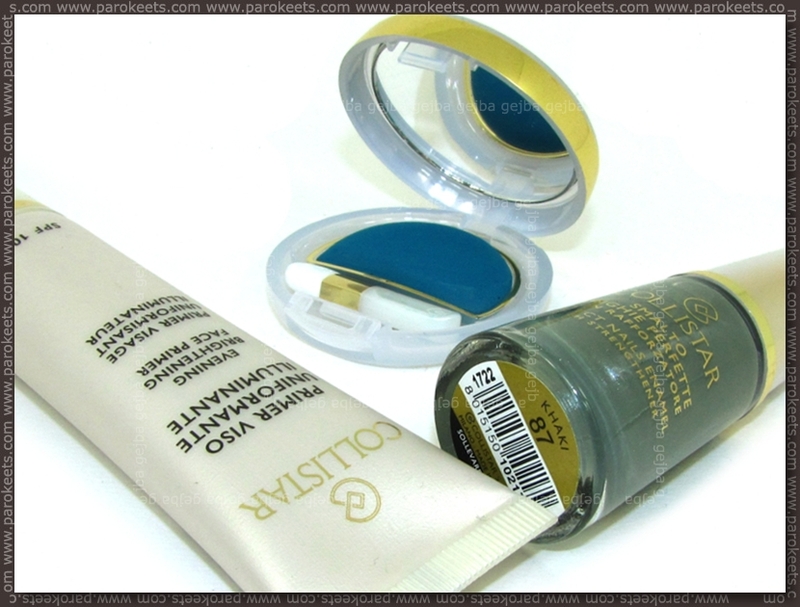 Then came Collistar Capri limited edition and I was excited to see that they released LE with satin like eyeshadows. I was keeping my fingers crossed that they’ll be continuing the trend and my wishes came true the first time I saw Collistar Milano LE. I admit I’m fickle and wish that they still came out with glittery nail polishes, but kept rest of the make up in light shimmer, satin, matte specter. Khaki nail polish is the prettiest and most interesting product for me in Milano LE. It does have fine milled shimmer which is seen on nails under stronger light, but what sold it to me was the unique base color. It’s hard to find these kind of gray-green shades in cooler part of the specter and in tone that works with warmer skin-tones. Unfortunately it does get warm undertone in sunlight, so I’ll be wearing it in fall/winter time when we don’t have that much sunny days. I used 2 coats + top coat. Laguna eyeshadow is not really matte finish when you look at it in the pan, but on the eyelids all you can see is the satin/matte color. 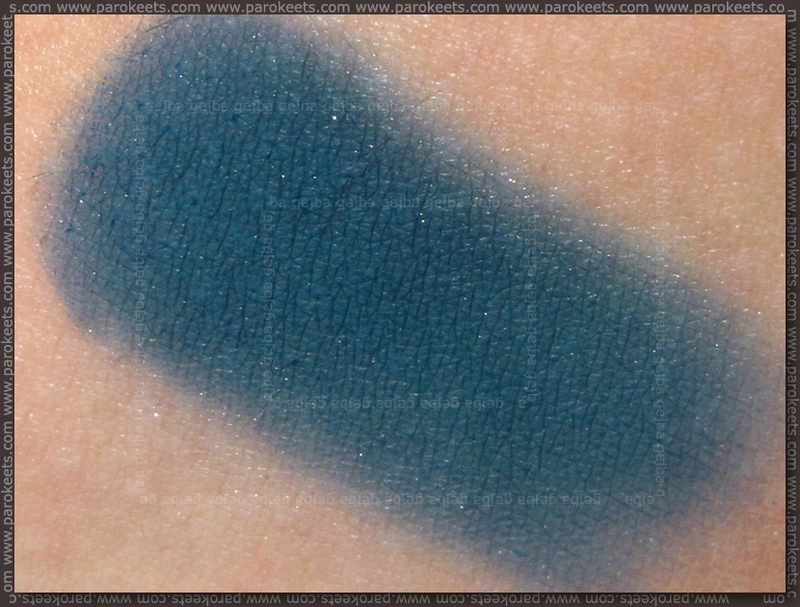 Color is primarily blue with slight greenish undertones so I guess you could say it’s petrol shade. These kind of shades don’t look good if I use them all over the lid, but are lovely as pop shades. I wore this twice with Collistar Turchese Satin from Capri LE and received more compliments that for all other make up looks this year combined. :D I tried photographing make up, but my camera was not picking up difference, then I made video and Laguna looked green so I gave up (you can see how approximate look in the below photo). I used waxy base for the swatch and 2 layers. You can see the intensity over Collistar Evening Brightening Face Primer in Milano LE video. As this primer had “evening” and “brightening” in the name, I was afraid that it would be shimmery, but the shimmer is so tiny that you practically don’t even see it and gives you more of a sheen that shimmery look. It’s OK face primer – not greasy, doesn’t leave the plastic feel on your face, foundations are easier to apply and last on me ~2 hours longer (not so much shine free as that they stick to the skin better). What I ended up using this primer is mostly as my primary eyeshadow base. I wasn’t sure if I should try it on eyes or not as this is perfumed product, but so far I didn’t notice any kind of reaction. This is one of those primers that cause eyeshadow to fade rather than crease, so I’ve been using it for make up that needed to last 10+ hours and I was satisfied with result. Did you get any of the Collistar Milano LE products? Maybe something I definitively should have in my life? All the Capri products still exist. There where no limited editions. The only limited edition in the milano are the Tattoo lipsticks and the hightlighter.